HWPL, the host of the event, is a non-profit international peace organization that is spreading peace movement most enthusiastically and systematically in the world. HWPL has affiliated organizations, IWPG, and IPYG, they are working through and for the women and youth members in the world. Initiated and led by Chairman Man Hee Lee of HWPL, the affiliates are proceeding to enact an international law to cease all wars besides the establishment of the WARP Offices. 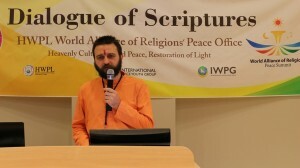 Heavenly Culture, World Peace, Restoration of Light (“HWPL”, Chairman Man Hee Lee) held their first Dialogue of Scriptures through the World Alliance of Religions’ Peace (WARP) Office at Riga Business School in Riga, Latvia on June 11th 2015. Embarking on the very first dialogue in Latvia, a Hindu representative Yogi Matsyendranath (of Natha Sampradaya) and other religious leaders from various faiths such as Lutheran Church, Buddhism, Catholicism, and Islam presented and discussed under the theme of ‘Definition of True Peace according to the Scripture.’Also headed by Randa Medne, the president of a youth group ‘Latvian 4-H’, and Gatis Kondrats, a founder of ‘Street warriors’, many youth participated and had Q&A time about the contents of the presentations. The event first began by watching introduction videos of HWPL and WARP Summit, an unprecedented international peace festival held in last September in Republic of Korea. 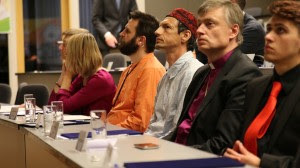 All the religious leaders who had seen the video of WARP summit for the first time were pleased to join such a great peace activity as Latvian peace delegates, being amazed by the large scale of HWPL’s peace movement. Through the presentations of each religious leader, the important role of religious leader to establish peace was emphasized which led to the signing of the peace agreement, promising each other that they will continuously meet together for the purpose of peace. By listening to the statements of religious leaders, the youth participants had confidence that this meeting that discovers the answer to peace within each religious scripture would be the basis of all peace works. Heavenly Culture, World Peace, Restoration of Light (“HWPL”), the host of the event, is a non-profit international peace organization that is spreading peace movement most enthusiastically and systematically in the world. HWPL has affiliated organizations, International Women’s Peace Group (“IWPG”), and International Peace Youth Group (“IPYG”) and they are working through and for the women and youth members in the world. Initiated and led by Chairman Man Hee Lee of HWPL, the affiliates are proceeding to enact an international law to cease all wars besides the establishment of the WARP Offices. Chairman Man Hee Lee played a key role in ending a 40-year religious conflict in Mindanao, Philippines where it used to be the hotspot of Asia. On May 25th 2015, he visited Mindanao and participated in the 2nd Annual Commemoration of the Declaration of World Peace and held International Peace Youth Group Walk Festival. By doing this, Catholic and Muslim representatives expressed their will to collect all hearts of the people for peace. With a growing support and cooperation of the international community, well-known places like city of Alexandria in Virginia state, Mindanao Philippines, and Royal Bafokeng Nation in Republic of South Africa have acknowledged HWPL’s achievements by unveiling peace monuments and designating May 25th as ‘HWPL Day’ as a day of world peace.